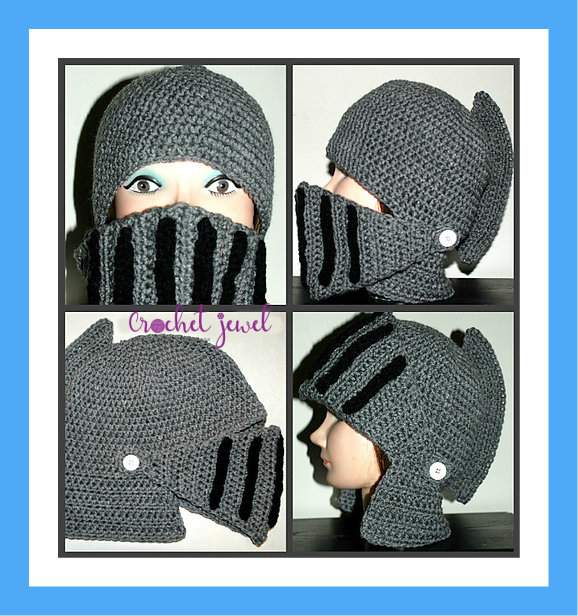 How to Crochet Boy's & Man's Knight Helmet Hat Videos! This knight hat is fun to make for any man or boy! It works up nicely and there are videos to help you along the process. ch 5, sl st, to form a ring. rnd 7. *work a hdc in the next 5 stitches, 2 hdc in the next stitch, *repeat around, continue around. (70 hdc) Make sure you have around 70 stitches around to make it big enough for a man's head. row 1. Chain 5, Slip Stitch to Form a ring, Ch 2, work 11 hdc in the ring. row 32. With Grey yarn, Slip Stitch into the first 2 hdc, Chain 5, Slip Stitch in the same stitch as the chain 5, Slip Stitch into the next 2 hdc, Turn, Slip Stitch back into the next hdc after you turned, then Slip Stitch into the Chain 5, ch 1, work 12 hdc into the ring, Slip Stitch in the chain 5, Slip stitch into the next hdc. Fasten off. Weave in the ends. Make 2 of Each. Chain 20, work sc in the 2nd chain from the hook and each stitch across, slip stitch into the last stitch. Fasten off. Chain 18, work sc in the 2nd chain from the hook and each stitch across, slip stitch into the last stitch. Fasten off. Chain 16, work sc in the 2nd chain from the hook and each stitch across, slip stitch into the last stitch. Fasten off. Now Take the Two Chain 20 Strips and Sew them onto the Mask, Fold the Mask in half (This will help you find your center) and sew the black strip onto the center side by side about 1 inch apart. Now Take the Two Chain 18 Strips and Sew them onto the Mask, Sew one Chain 18 Strip on one side of the Chain 20 strip about 1.5 inches apart and Sew the other Chain 18 Strip onto the other side of the Chain 20 strip. Now Take the Two Chain 16 Strips and Sew them onto the Mask, Sew one Chain 16 Strip on one side of the Chain 18 strip about 1.5 inches apart and Sew the other Chain 16 Strip onto the other side of the Chain 18 strip. Sew Two buttons on each side of the Side Flaps, Make sure the Buttons are far enough over on each side of the Side Flaps so the Button loops of the Mask is tight enough to cover your face. Sew the Arch on top of the hat, First fold the hat in half, find the back center of the hat. Sew the arch at the center top and down the center. Do you know the equivalent size hooks in English please? How much yarn do you need for this? This is going to be an expectation vs. reality project and I'm only on round 5! Thank you so much for this pattern! It was very easy to follow. I did make some alterations to it: 1) starting the hat using a magic circle allows you to fully close it. 2) after making the mask I SC around to give it clean edges and better hide color change over. 3) with the fin work normal but then rows 5 - 7 is just working backwards rows 1-3to decreasing instead increasing. This allows you to fold the fin in half before attaching to help it keep its shape and more sturdy. Hope this helps and you approve of my alterations! I made this, with the alterations suggested by "Unknown" on December 30, 2018. I think the alterations were helpful. Thanks for the original pattern and the alterations!